November 4, 2013 /0 Comments/in Diabetes /by Jenn F.
Diabetes is a devastating diagnosis for the entire family. It’s important for people to know that the tendency to develop type 2 diabetes runs in the family, but is also greatly influenced by lifestyle choices. Often, detecting the signs early can help individuals prevent the development of the diabetes. 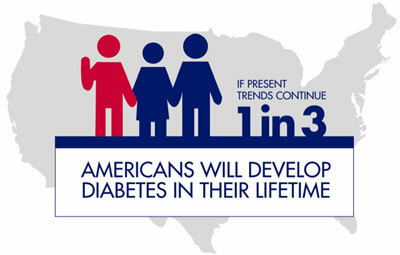 In fact, the CDC’s National Diabetes Prevention Program can help people cut their risk of developing diabetes in half. November is National Diabetes Awareness Month to highlight the importance of support, management and prevention of this common disease. – One in 10 Americans currently have diabetes. – That translates to nearly 26 million adults and children in the U.S.
– 79 million Americans are at risk for developing type 2 diabetes. – The national cost of patients diagnosed with diabetes is $245 billion. – 60-70% of people with diabetes have some type of nerve damage. – The rate of amputation for diabetics is 10 times higher. – Diabetes is the leading cause of non-traumatic, lower-limb amputations in the U.S.
Do You Know The Early Warning Signs of Diabetes? The Centers for Disease Control and Prevention predicts that one in three Americans will have diabetes by 2050 unless steps are taken to detect the warning signs and prevent the onset. Early warning signs of diabetes often appear in the feet first. Therefore, it’s important to assess the feet daily for signs of numbness, redness, tingling, burning, loss of toe hair, or slow-healing cuts and scrapes. If you notice any of these symptoms, see a podiatrist right away. By receiving appropriate medical care, increasing exercise and maintaining a proper diet, you may be able to prevent the unpleasant symptoms and side effects of diabetes. We developed the SteriShoe UV shoe sanitizer to help people with diabetes take the best possible care of their feet. It’s impossible to avoid all contact with fungus, bacteria, viruses. However, you can prevent these pathogens from festering into infections, ulcers, gangrene and wounds in need of amputation. Our device sanitizes your footwear of 99.9% of these harmful microbes in one 45-minute treatment. Use daily to prevent build-up of unsanitary specimens!